IAB talks B2B is a destination point for practical insights and expertise into the world of digital business to business marketing. This channel will cover marketing topics including search, email, display, video, ecommerce, affiliates, social media, mobile and other emerging formats. Content is provided by our B2B Council, a group of leading experts in the field, who ensure content is up-to-date, accurate and relevant to the current marketing environment. If you are interested in providing content, please contact the Council through Jack Wallington, jack@iabuk.net, the IAB’s Senior Programmes Manager. What are the trends in B2B marketing for 2011 and beyond? Are you making the most out of your digital channels and have attitudes towards digital marketing changed from 2009? Interact live Hanne Tuomisto-Inch, Industry Head at Google as she dives into the survey resutls, highlighting the key themes that will shape B2B marketing strategies in the coming years. 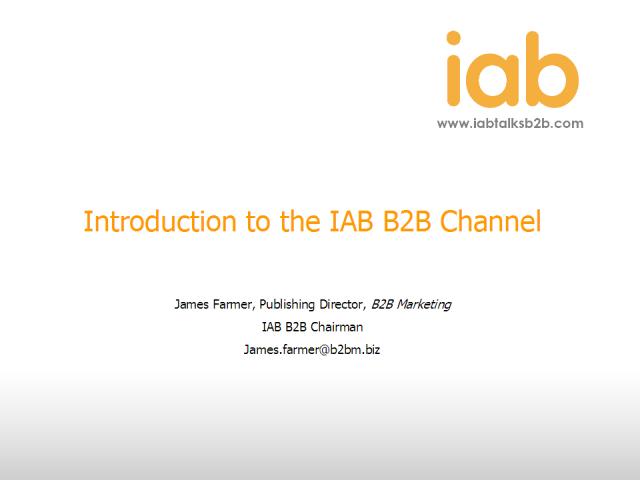 Earlier in the year the IAB B2B Council wanted to find out more about the B2B market. This research was carried out via an online questionnaire with a specific B2B audience across all vertical industries. The aim was to establish a snapshot of the state of the B2B digital market and identify areas or issues that the IAB's B2B initiatives can help address. To see the results and the IAB B2B Council's thoughts register today for this webcast. Every business needs the same thing. Customers. Using video to promote your business, products and services on your website is a fast and dynamic way of communicating what your company does to your existing and prospective customers. Now that marketers are increasingly planning to invest in online video to reach their consumers, they also need to understand how to get more people to watch these videos and here is where you will learn how. This webcast will explain the two key sides of syndication. So if you are looking to gain exposure or need engaging content for your website, we'll show you how you can use a syndication model which will meet your objectives and provide you with additional revenue. Simply has conducted the first qualitative research, Branded Content Online - What does the viewer see?, to unpick the complexities of what viewers think of branded video online and to outline a series of guidelines for creating engaging content. This webcast will show you, step-by-step, what you need to consider and how to go about creating an online video campaign. We’ll show you how to get the best out of your campaign, helping you to meet your objectives. Some ideas and thoughts about how to get more of your site visitors to convert on your site for short or quick cycle conversions such as SMEs. Nicki Lynas from the IAB looks at the trends in the wider online market and how these might affect the B2B sector in 2009. The impact of the downturn on advertising will have an effect on B2B activity but this overview from the IAB aims to put in context the trends in different formats and the way that this might play out in the B2B sector.